As winter wanes and spring begins, sap rises from the roots and travels to the treetops. The liquid gold drips off the spout, slowly filling the pail. If tapping is done too early, the tap holes may dry up; if done too late, the season may be over in a week and missed completely. Sunshine from the South shines in the leafless forest, giving warmth to the trees even though the air is still chilly. A 1/2 inch or 3/4 inch hole is bored waist high and about 2 inches deep into the tree. A spile (spout) made of hardwood is driven into the hole to fit snugly. 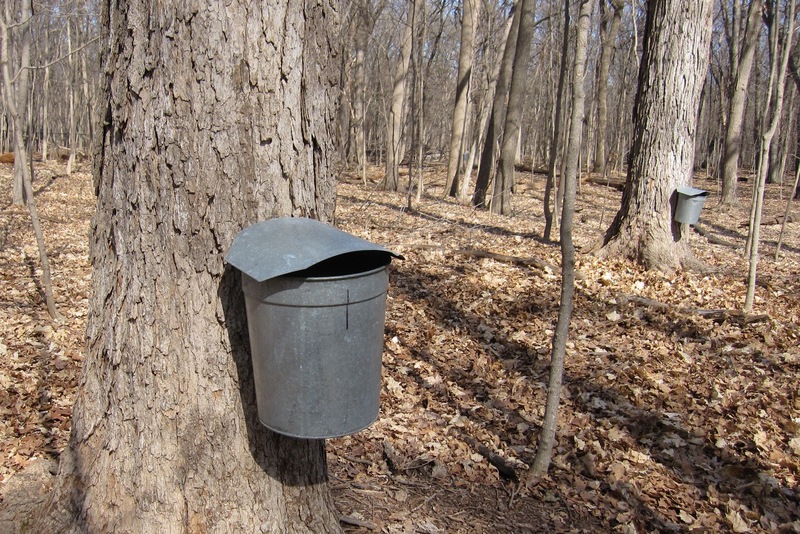 A bucket is hung on the spile to collect the sap. 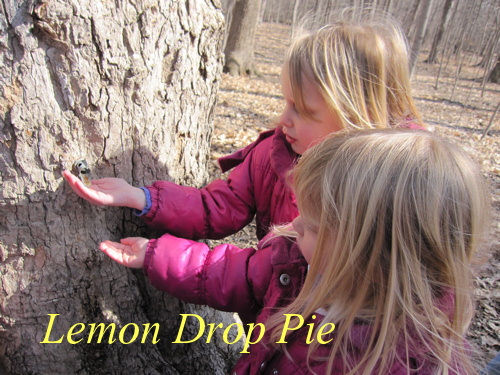 The girls catch the running sap with their hands and greedily lick their fingers. Raw sap is 97% water, maple syrup is about 37% water. This excess water must be cooked off in a large kettle or evaporating device. The resulting liquid is sugar and mineral salts. Sap has just a touch of sweetness but mostly tastes like water. 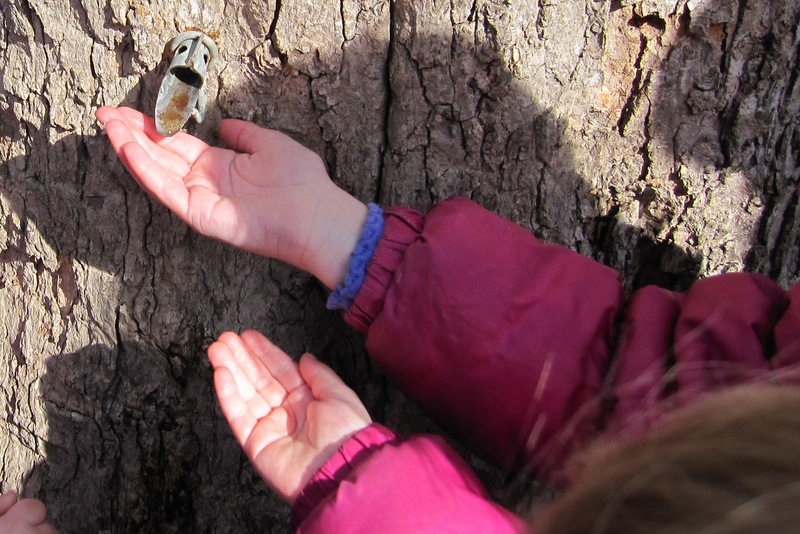 This doesn’t stop Emmy and Lily from collecting more sap on their fingertips! At this altitude the syrup must reach a temperature of 218°F to be called maple syrup. If maple sugar is desired, continue cooking until the boiling point of 234°F is reached. Mmmm, maple syrup! Lily doesn’t even need the French toast stick. She simply drinks the sweet stuff. It requires 40 gallons of sap to make one gallon of syrup. If syrup is boiled between 218°F and 234°F you get “Jack Wax”, a chewy sweet, much like taffy. *The text in this post is from this sign, posted at Maple Syrup Days. However, the captions are mine. LOVE real maple syrup: it's worth the money to me! These are really GREAT pictures. Wow, that was really interesting. Thank you. 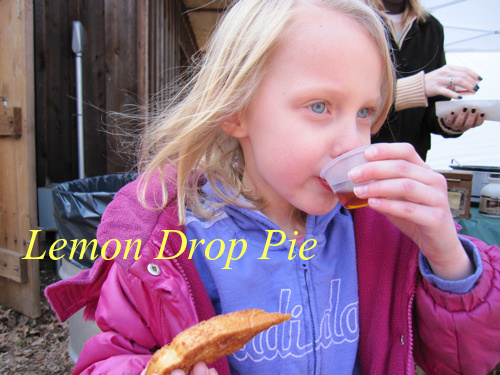 I think that would be the coolest thing ever to be able to just drink syrup from a tree! Alas, not in FL. THe girls are getting so big! Now I want to make a recipe involving maple syrup or maple sugar! Hmm, I'll have to see what I can find. If you know of any, let me know. I'll try them out on my blog. You brought back wonderful memories for me. I used to love to take the kids to festivals where they did this! What a fantastic outing. I wish we had something like that here. I never even tasted actual maple syrup until recently. I always opted for the cheaper "pancake" syrup variety. Just like a kid to go straight for the syrup. This is just soooooooo neat to me….because I have never seen it or experienced it. Another blogger also showed this and I wished I could take a trip and come see it. How much fun.